On April 16, 2018, University of Florida environmental history professor Jack E. Davis won the Pulitzer Prize for History for his book on the Gulf of Mexico. 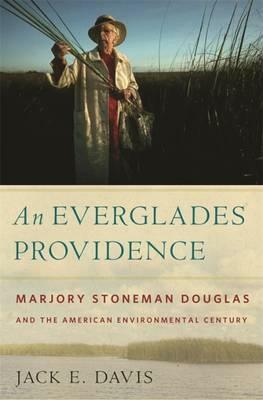 His earlier book, on Marjory Stoneman Douglas, is a classic biography of a leading Florida environmentalist. A 1957 Pulitzer Prize winner for History, Jack Kennedy (for Profiles in Courage) was elected President in 1960. University of Florida history professor Jack E. Davis is the winner of the 2018 Pulitzer Prize in History for his book “The Gulf: The Making of an American Sea,” the Pulitzer Prize Board announced today. Davis said he was in his office Monday afternoon meeting with a student when his phone began pinging repeatedly. He didn’t know why. “The Gulf” also won the Kirkus Prize, was a finalist for the National Book Critics Circle Award, was a New York Times Notable Book, and made a number of other “best of” lists in national publications. Davis received his Ph.D. in 1994 at Brandeis University. He works with students whose interests lie in environmental history. Before joining the UF faculty, he taught at the University of Alabama at Birmingham, where he was director of environmental studies; the University of Jordan, where he was a Fulbright scholar; and Eckerd College. In 2004, he launched the department’s student journal, Alpata: A Journal of History, and remains its faculty advisor. His “Race Against Time: Culture and Separation in Natchez Since 1930” won the Charles S. Sydnor Prize for the best book in southern history published in 2001. He has edited three anthologies (on the civil rights movement, female activism in Florida, and Florida environmental history) and a [biography of] Marjory Stoneman Douglas. Florida got a shoutout from the Pulitzer Prizes on Monday: The 2018 literary prize for history was awarded to University of Florida professor Jack E. Davis for his book The Gulf: The Making of an American Sea. Davis, who grew up in Pinellas County and earned his bachelor’s and master’s degree from the University of South Florida, focuses on the Gulf of Mexico in his sweeping, deeply researched and elegantly written book. The Gulf, published in March 2017, had already won the Kirkus Prize and been a finalist for the National Book Critics Circle award. Davis talked with the Tampa Bay Times by phone from Gainesville after the awards were announced Monday afternoon. How did you find out you had won the Pulitzer Prize? I was in the middle of individual meetings with graduate students all afternoon. All the phones started ringing, my office phone, my cell. I was getting all these calls and texts. I was like, "Leave me alone!" I finally thought I’d better answer, in case somebody had died. I read the text and I was literally speechless. I just pushed it across the desk to the graduate student. He said, "Congratulations!" I’ve been in my office ever since. I talked to my editor, to the people at (Liveright/W.W. Norton, his publisher). I’ve got about 45 emails, I don’t know how many phone calls. I’m shaking. I’m incredulous. It’s just unbelievable. What has the response to the book been from your colleagues? (UF President Kent) Fuchs has been a huge champion of the book. It’s been really wonderful to feel that work is valued by the university. He gave copies of the book to everyone on the Board of Trustees. All along, even before the Pulitzer, the appreciation I’ve felt from the department and the university has been heartwarming and rewarding. I also have to say how much I appreciate what you and the Tampa Bay Times do to support reading and literature. It’s a very important part of American culture. How have readers responded to the book? This (award) is really for the gulf, I mean the Gulf of Mexico. I’m so pleased that the Gulf of Mexico has so much of a place in American life. I think it shows how much Americans feel connected to the sea, and that they care so much about it. I get just wonderful responses from readers, like I did in the reviews. I get emails every week. I got one yesterday from New Hampshire. I get them from California, Illinois — not just gulfside states. You always get one or two crackpots, but I have not gotten that with this book. Early on, I got one that said, "You tree-hugger bleeding-heart liberal." But just one! I’m just trying to generate excitement about the Gulf of Mexico, and wherever I go the audiences have been fabulous. They’re engaged and interested and concerned. I’ll be speaking in St. Pete on Monday, at Preserve the Burg at Freefall Theatre. They got me cheap! What’s next for you, after the Pulitzer Prize ceremony? The Gulf just came out in paperback in March, and I’m so happy that my next book will (also) be published by Liveright. Bob Weil and his crew are just great. I know they’re very, very pleased with the reception to this book. The next one is a cultural and natural history of the bald eagle. I can tell you the title: Bird of Paradox: How the Bald Eagle Saved the Soul of America. I’m pushing it a little with that subtitle, but I’ll make it work. Contact Colette Bancroft at cbancroft@tampabay.com or (727) 893-8435. Follow @colettemb. "Anonymouse," I can just feel the love! I wear the scorn of the "Anonymice" as a badge of honor.